Nothing seemed to predispose Lanskoy for a career as an artist, although he was to become a master of colour. As the son of Count Lanskoy, a career in the army appeared inevitable. He entered the Page Corp (1908) and then attended the Cadet Corp school in Saint Petersburg (1917). As an adolescent, he had a pronounced taste for visual manifestations of colour, notably those to be found in daily life and the objects of Russian folk culture. He loved ‘Charmankas’ (barrel organs) with their many-coloured ribbons and gaily coloured ‘Petrouchkas’ (puppets), and collected tramway tickets that he arranged according to their different colours. With his friends he frequented an artistic cabaret that had been decorated by Soudeïkine, and many years later recalled its colourful scenes drawn from folklore. At this stage of his life he knew nothing about painting. In 1919 he took refuge in Kiev, where he spent two months drawing and colouring. He then enlisted in the White Army, which he followed to Crimea and Constantinople. He finally arrived in Paris in the spring of 1921, remaining in the city for the rest of his life. Lanskoy immediately began to paint. He met the Russian painters Bart and Soudeïkine. The latter attempted to give him lessons, but in fact only managed to teach the young man to clean his palette. He received his real training by frequenting the galleries of rue La Boétie, and also the collections at the Louvre, where he admired works by Velasquez, El Greco, the Italian Primitives and the Venetian School. All this was nothing, however, compared to the shock he received when he, for the first time, saw Douanier Rousseau’s Portrait du peintre avec sa palette. He read Van Gogh’s correspondence with his brother Théo and often went to look at the artist’s work, for which he felt a growing admiration. In 1922 he worked at the Grande Chaumière and began to paint from nature at Meudon and Clamart, producing a large number of sketches and watercolours. Until 1937 Lanskoy favoured the image and what we can only call the ‘identifiable’, although he subsequently always refused to confirm the duality opposing abstraction and figuration, nature participating in the development of each of his styles, which he never considered to be antagonistic. This early period was marked by a technical evolution manifested in his palette, which is beyond the scope of this discussion (but for which Michel Pittiglio’s book is recommended). We should recall, however, that Lanskoy achieved a position of prominence among Russian artists, with whom he showed in 1923 at the Galerie La Licorne and, in 1924, at the Galerie Carmine with Soutine. The Russians visited him in the small room in rue Delambre, where he painted at the time: Terechkovitch, the Delaunays, Survage, Pougny and Zadkine, who brought him his first client: Zborovsky. Lanskoy made his début at the Salon d’Automne in 1923, where he showed until 1930, and the following year Wilheim Uhde noticed his entry and bought his entire production. It was to this great collector, at whose house he saw works by Bombois and Vivin, that he owed his first contract with the Galerie Bing at number 20 bis rue La Boétie. At the gallery he had a decisive meeting with the collector Roger Dutilleul (Donation Dutilleul – Masurel, Musée Villeneuve-d’Ascq). The gallery gave him a solo exhibition in 1925. From 1928 to 1944, when the Galerie Carré began to handle his work, Roger Dutilleul supported Lanskoy financially and enabled him to continue painting. From 1935 he participated in the Salon des Tuileries (where he showed works in 1948, 1954, 1955, 1959 and 1961), although he no longer exhibited in a private gallery. From 1937 his growing interest in the works of Klee and Kandinsky gradually brought Lanskoy to distance himself from the object and, in 1941, he finally made the break with figuration. He painted gouaches in which the forms became coloured stains that established themselves as the picture’s aim: “When we take colour from the palette, it is no more figurative because it is intended to represent a flower, or more abstract if it is to give birth to an imaginary form… A stain placed on the canvas seeks to take on a form and fights with the other forms already placed on the same canvas. 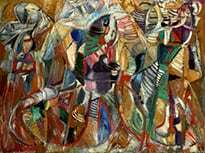 The painting is born from the outcome of this struggle,” Lanskoy wrote in 1952 (Lanskoy 1925–1952 van figuratief naar Abstract. Antwerp, Zaal CAW, with a text by R.V. Gindertaël). This intermediary phase, which was to extend beyond figuration, was fundamental for Lanskoy, and he perceived “the need to take a greater risk and to give much more of himself” (op. cit.). In 1944 this led him to pure abstraction. In 1942 he exhibited his transitional works at the Galerie Berry-Raspail, and in 1944 showed his recent works at the Galerie Jeanne Bucher, which had been closed on several occasions by the Germans. In the same year Roger Dutilleul introduced him to Louis Carré, at whose gallery Lanskoy showed until 1961. In 1945 another important meeting took place, with Nicolas de Stael who, having seen paintings by his elder compatriot at the Galerie Jeanne Bucher, had asked to meet him. A deep friendship and working relationship began, which united the two artists until de Stael’s death in 1955. Their parallel research presented obvious similarities and Lanskoy’s influence is evident. The Galerie Louis Carré had been established since January 1938 at number 10 avenue de Messine, and was one of the galleries that showed the works of the artists of the École de Paris: we find there Picasso, Matisse, Vuillard, Rouault and, after the war, Robert Delaunay, Jacques Villon, Estève, Kupka, Hartung, Soulages and de Stael. In 1949 the gallery opened a branch in New York. Lanskoy was included in the gallery’s group exhibitions. Artistic activity revived amid polemics fed by passionate debates that divided critics and the public over figuration versus abstraction. Lanskoy wrote about this conflict: “Painting has always been abstract, but we didn’t notice; it is therefore not really possible to talk about a rupture” (op. cit.). Indeed, at his exhibitions, Lanskoy’s figurative work was very often presented alongside his abstract work. In 1948 he had his first solo exhibition at the Galerie Louis Carré, with Œuvres 1944–1948. The earliest of these works have well-defined lines that can still be said to evoke figurative elements; the composition then structures the forms so that the subject only remains present through colour. The more recent works make a definitive break with figurative representation. A graphic visual style is introduced, rapidly identifiable as a signature. The composition is based on a network of curved lines with obliques, ellipses and spirals whose complexity offers a combination of rhythmic geometrical forms, inherent in all Lanskoy’s work, without any relation to reality. This formal structure is mirrored by an equally codified combination of colours: cold shades of blue, harsh greens, violets and pinks alternate with warm shades of scarlet, orange, yellow, ochre and browns. Lanskoy either spreads his paste or modulates it. The artist has explained the way in which he then worked: “I begin by making a quick sketch in charcoal or pastel: this is the skeleton of the painting, which is always fairly elastic. The first waves of colour change it, but do not make it disappear completely. Then I work on the forms and study their relationships from the angle of technique and colour. Sometimes I introduce a new black or white style, related to the idea which served me as a starting point or following the rhythmic requirements of the forms” (Notes sur ma peinture, Paris, private archives, 1949). During this period we see a number of characteristics gradually develop that subsequently became established features in Lanskoy’s work: a rigorously constructed composition underpinned by drawing (the sketch which preceded each painting played an important role) to which colour is subordinated; and a dominant colour within a luxuriant palette, whose brightness is enhanced by superposed values, with the light catching the irregularities or parallel lines in the texture. White is employed to provide light and contrasts with black, employed as the dominant colour in certain works to set off the coloured interlacing. Lastly, wide flat layers of paint contrast with lumpy uneven surfaces painted with fragmented brush strokes laid on with considerable gestural freedom. Lanskoy exhibited in Paris in 1949 at the Galerie Des Garets, 1951 Galerie Jacques Dubourg Œuvres de 1925 à 1935. 1952 Galerie Louis Carré Peintures 1925–1952, which he showed again in 1957 Peintures 1954–1957, catalogue with a text Ebauche d’un portrait by R.V. Gindertaël. In 1956 another influential critic, Jean Grenier, wrote about Lanskoy’s work: “Lanskoy will certainly be classed among those seeking the exaltation of colour and who know how to get the most out of the thickness of the impasto… A work violent, luxuriant, tumultuous and barbaric in its appearance” (L’Œil, May 1956). 1959 Galerie Raymonde Cazenave Lanskoy, Peintures 1947–1958, text by R.V. Gindertaël, who wrote the preface for the Lanskoy exhibition at the Palais Galliéra in 1966. In the meantime there had been Paris exhibitions: in 1956 Galerie Palmes Dessins 1922–1956. 1958 Galerie Claude Bernard Gouaches. 1959 Librairie Pierre Bérès Cortège, illustrations for the book by Pierre Lecuire. 1960 Galerie Charpentier Vingt gouaches and Galerie Claude Bernard Papiers collés. 1961 Galerie Europe Lanskoy, Dix peintures récentes. 1962 Galerie Kriegel. 1970 Galerie G. Bongers Peintures, collages, dessins. 1975 Galerie de Seine. Posthumous exhibition in 1977, Maison de l’Iran, André Lanskoy, dernières œuvres, text by Gaston Diehl. From 1953 there was an increasing number of solo exhibitions in the French provinces and abroad. We should mention: 1953 Paintings 1925–1953, Arthur Tooth & Sons Gallery, London. 1954 Wuppertal Galerie Parnass. 1955 Oljemälningar 1944–1954, Svenska-Franska Konstgalleriet, Stockholm, with a text Notes sur ma peinture by André Lanskoy; he exhibited his works at this gallery again between 1958 and 1961. 1956 first exhibition in New York, Fine Arts Associates, with recent works; then the Galerie Albert Loeb in 1959, text by Chantal Maisonnier, in 1960, 1961, 1962, and in 1965 at the Galerie Knoedler with a text by R.V. Gindertaël. In 1959 he exhibited in Geneva, Galerie Benador, with a text by Yvon Taillandier, and in 1961 at the Musée de l’Athénée. 1961 Kaplan Gallery, London. 1962 Galerie Dorothie Leonhart, Munich. 1963 Galerie Im Erker, Saint-Gall, text by Yvon Taillandier and André Lanskoy; he also showed in Dusseldorf and Frankfurt, and at Roanne showed Cortège as well as at Reims in 1964 at the Galerie Droulez with Dédale. Other exhibitions followed. It is only possible here to mention a few of the artist’s many participations in group exhibitions (see the complete list in the work by Pittiglio). 1949 Rythmes et couleurs, Galerie Bernheim Jeune, Paris. 1950 South Africa, travelling exhibition of contemporary French art; Gouaches, printemps de la peinture with Bazaine, Lapicque, Léger, Magnelli, Manessier, Prassinos, Reichel, Vieira da Silva, Villeri, Galerie La Hune, Paris; L’École de Paris: 1900–1950, London, Royal Academy of Art; Advancing French Art with Bazaine, Estève, Hartung, Lapicque, de Stael, Galerie Louis Carré, New York. 1951 Hartung, Lanskoy, Schneider, Galerie Louis Carré, Paris. 1952 Rythmes et couleurs. Art français, Musée des Beaux-Arts, Lausanne; La Nouvelle École de Paris, Galerie de Babylone, Paris. 1953 Younger European Painters, Guggenheim Museum, New York; travelling exhibitions in Japan (Second International Art Exhibition) and in Australia (French Painting Today). 1954 Current Trends in French Art, Ostend, Kursaal. 1955 Regards sur la peinture contemporaine, Musée Galliéra, Paris; La Nouvelle École de Paris, Galerie Craven, Paris; travelling exhibition in Madrid and Barcelona Recent Trends in French Painting. 1956 Dix ans de peinture française 1945–1955, Musée de Grenoble; Contemporary French Art, Museum of Mexico; Festival de l’Art d’avant-garde, Marseille. 1958 Tapisseries françaises contemporaines, Palais Saint-Vaast, Arras; Rencontre d’octobre à Nantes. Aspects de la peinture d’aujourd’hui, Musée de Nantes. 1959 Fifteen Painters from Paris, Corcoran Gallery, Washington; The School of Paris 1959, the Internationals with Appel, Hartung, Riopelle and Schneider. Soulages, Vieira da Silva, Zao Wou-Ki, Walker Art Center, Minneapolis. 1960 École de Paris, Musée de Tokyo; Galerie Jeanne Bucher 1925–1960, Galerie Jeanne Bucher, Paris; Peintres russes de l’École de Paris, Musée de Saint-Denis. 1961 Painters of Today, France-Italy, Turin. 1962 École de Paris, Galleria Levi, Milan; École de Paris: Appel, Atlan, Helman, Lanskoy, Music, Pignon, Poliakoff, Galleria il Centro, Naples; Dubuffet, Estève, Fautrier, Lanskoy, Miró, Poliakoff, Riopelle, Tapiès, Svensk-Franska Konstgalleriet, Stockholm. 1963 La grande aventure de l’art du XXe siècle, Château des Rohan, Strasbourg. 1964 Figuratie and Defiguratie, Musée de Gand: 50 ans de collages, Musée de Saint-Etienne. 1965 Aspekte 1944–1965, Galerie Beyeler, Basel. Lanskoy took part in the Salon de Mai in 1949, 1950 and from 1955 to 1961, in 1960 in Zurich, and in 1961 in Amsterdam where the Salon had been invited; in the Salon des Réalités Nouvelles in 1962, 1963 and 1967, with a tribute in 1977. He was invited to participate in l’École de Paris at the Galerie Charpentier from 1954 to 1959. Grands et Jeunes d’aujourd’hui in 1964, 1966 and 1968. At the Carnegie Institute, Pittsburgh in 1952, 1955, 1959 and 1961. Documenta Kassel in 1959 and 1964. From 1951 Lanskoy worked on cartoons for tapestries for the Manufacture d’Aubusson, working from gouaches and collages. A tapestry was acquired in 1958 for the liner France. He illustrated texts and, in 1959, made a collage for Cortège by Pierre Lecuire and, in 1961, etchings for Lecuire’s Dédale. For La Genèse (1966) he used gouache and lithography. His most important illustrated work remains that for Gogol’s Diary of a Madman (1958–1968), with 169 collages composed of paper cut-outs and gouaches: exhibited at the Musée de Saint-Etienne in 1968, Creuset and, in 1970, at Mulhouse. At the end of his life, Lanskoy made mosaics and visited Ravenna (mosaics Faculté de Rennes, 1974). Lanskoy confided “I do non-figurative works from nature, or rather from life and always in harmony with life” (op. cit.). Charles Estienne wrote that Lanskoy belongs to the important movement of lyrical abstraction, which stems from Kandinsky. These artists share “gesturality”, a taste for “texture”, “the direct expression of nature, pure and free”. 1988 Œuvres sur papier. Galerie Pittiglio, Paris. Catalogue. 1989 Lanskoy – Galerie Pierre Guénégan, Paris. Publication of a book with a text by Catherine Zoubtchenko. 1990 Peintures 1944–1961. Galerie Louis Carré & Cie, Paris. Catalogue, text by Pierre Guégen, written in 1957 for the 1957 exhibition at the gallery. Biography, bibliography. Museums: Paris, Musée National d’Art Moderne, Centre Georges Pompidou and Art Moderne de la Ville de Paris – Colmar – Grenoble – Le Havre – Lille – Maubeuge – Mulhouse – Saint-Etienne – Tourcoing – Villeneuve-d’Ascq – New York – Toledo. Pascaline Dron, Angelo Pittiglio: André Lanskoy, Pittiglio, Paris, 1990.